We are proud to announce that The Paseos Community Association has selected Tinnelly Law Group as its new corporate counsel. The Paseos is the newest community in Murrieta’s French Valley and has an estimated build out of 122 gorgeous single family homes. This new community is located next to the Crown Valley Regional Sports Park and offers residents of The Paseos a peaceful living environment. Along with the tot lot dedicated to the kids, there is a variety of recreational activities such as swimming in the pool and playing tennis. 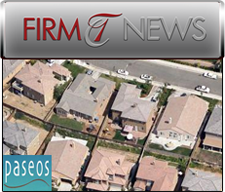 Our HOA lawyers and staff look forward to working with The Paseos Community throughout its construction phase and thereafter once complete. We enjoy helping new communities establish solid operational foundations that ensure their continued success.